Christmas cards – almost impossible to find something cool and classy. Or is it? 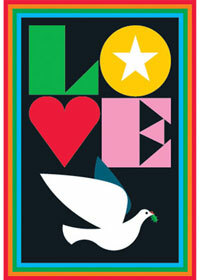 Not if you pick up these fantastic retro pop art Christmas cards from the V&A Museum Shop. The cards were designed by Clifford Richards exclusively for the V&A for this Christmas. Richards is a graphic designer going back to the 60s, specialising in producing graphics inspired by Pop Art. In fact, his work from the 60s and 70s is in the collection of the V&A Museum, so you’re sending some serious art to your friends and family. A box of 10 cards with envelopes (each measuring 12 x 17cm) costs an incredibly reasonable £6.